As someone who has attended both online and on-campus colleges/universities, I can see the benefit to both types of schools—especially depending on your life circumstances. I had a somewhat unconventional college experience as I attended 5 colleges/universities, three of which were Christian colleges, two of those were online, and two others were public on-campus universities. I have experienced small Christian colleges, online Christian colleges, and on-campus public universities—and I must say I enjoyed my time at each one. 1. You can take more classes — at a faster rate — on your own time. I started out at an on-campus college, and toward the end of my college career I switched to an online college because I needed to make up time for a year I took off from school. By taking online classes, at a school that was on the quarter system vs. the semester system, I was able to take 12 credits per quarter (24 credits for the semester) with special permission. This really helped me make up the time I had taken off. Online colleges also tend to offer a wider variety of summer classes, which can also help you get ahead. Online classwork usually consists of several papers, written projects, or online written discussion board assignments. There is a lot of writing involved in online courses and a lot of studying that must be done on your own. Usually the teacher provides a lecture video or lecture notes, but you are responsible for the reading and if you don’t study or complete the assignments you could fail. You need to be an independent learner in order to do well with online coursework. The quarter system, which many online universities have is a huge perk; how it works is that you take classes for 8 weeks (usually up to 9 credits, 2 or 3 classes) and submit all the required work and exams -- then you get a week off before the next 8 weeks starts with a new set of classes. It’s a great way to divide up 15-18 credits between two quarters so you can focus more on specific classes. If you’re someone who has trouble focusing on multiple classes, this is a great option. In addition, most online colleges offer accelerated degrees, which are especially helpful for working adults going back for their bachelor’s degree or upgrading their associates. 2. You can keep your day job and study at night. If you have a day job that you can’t quit (or don’t want to quit) or you have a family member you need to care for, online classes are a great way to go. You can accomplish the assignments and study the lecture and reading on your own time. Unless you’re ok working part-time or you have an hourly job that changes shifts every week, most full-time jobs aren’t flexible with their hours to allow for on-campus class time. Many on-campus colleges offer evening classes, but if you’ve worked all day it’s much more relaxing to go home and study in your own living room. Online classes usually require the student to log in to the system (most colleges use “Blackboard”) once a week; there are usually weekly assignments for writing and peer review. There may also be exams every week depending on the class. However, you can usually complete them at your convenience as long as they’re submitted by the due date. 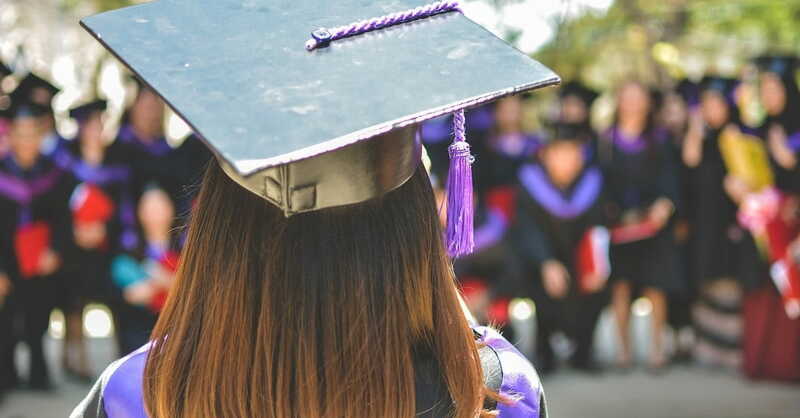 “A new study from Georgetown University's Center on Education and the Workforce finds that, over the past 25 years, more than 70 percent of college students have worked while attending school. And the number of working students has grown as college enrollment and tuition have increased.” -quoted from cnbc.com. For students who need to work or need to pay for their college, online degrees are a great option. 3. You can save money on housing, food, and possibly even text books. One campus I went to had hybrid classes. This meant that you went to class one day a week, to meet for lecture, and the rest of the week you were on your own for reading and studying and you also had to complete online discussion boards and comment on other classmates’ work. The majority of the work was done online though. I realized it was costing extra money for me to live on campus at this college, when I could take the same classes completely online and save housing and food money for my parents. Some colleges even offer online courses at a discounted rate compared to the on-campus version, due to costs that are able to be cut. Many textbooks also offer ebook versions, which can be cheaper than the material book. However, it can be difficult to flip back to certain pages in an ebook vs. a material book. If you can’t afford housing for college, and there is not a college close enough for you to commute to then online courses are a great option for someone who needs to stay where they are. It works for international students too who want to take U.S. courses, but can’t afford to move here. 4. You still get the same course options, advisor help, and library services. Most programs at online universities can be completed fully online, while other programs can be completed mostly online with some lab work for nurses, science majors, and intern programs for teachers and social workers etc. For example, Indiana Wesleyan University has a large online program with 90+ programs of study that are available fully online or partially online. Like most online universities, they also have an off-campus library program. So many books are in the ebook format now! 5. You will experience a diversity of people and grow in your communication skills. Yes, you would also experience diversity on campus; however, the type of diversity that you see online (adults returning to school, military personnel taking classes for the first time, students young and old from all over the U.S. and sometimes internationally) is a greater percentage. There will be a larger percentage of older adults, married adults, women with families, people working part-time or full-time etc. If you’re looking for a young group of people that are in the freshman category, then you may find your online class lacking. You will get to know these people when you respond to the discussion prompts and reply to your classmates’ posts. There is quite a bit of writing for group projects or paper assignments. You will learn how to best express yourself and how to listen to and respond to others well. If you’re an international student who can't travel to the U.S., then online classes are a great way to meet people across the globe and communicate on topics you want to learn more about. Students with disabilities may also find online colleges helpful if the on-campus schools they’re looking at do not provide what they need. You can sample an online class here at Liberty University Online to see if the online discussion board format is for you. Bonus tip: Distance learning actually started in the 19th century! 1.You prefer face-to-face teaching and lectures. If you’re working and you know when you go home that you’ll just be tired — and won’t want to open that book or study the lecture — then online classes aren’t the way to go. Some students learn easier when they have someone right in front of them speaking to them and asking them to participate. I had several papers or projects that I kept putting off to the last minute, and even though you can still procrastinate at on-campus colleges, you don’t have that weekly face-to-face interaction reminding you to stay on target. Some students prefer to sit in a classroom, to take notes in person, and to listen actively to a lecturer. It’s easier to bond with your professor when you’re sitting in the same room. There is certainly something to say for face-to-face interaction in the learning environment. 2. You want to meet new people and widen your social sphere. You’ll “meet” people online that you can communicate with over email or social media, but it’s not the same as meeting people in person on a campus. If you need to be around people and you don’t have an existing social group, then an on-campus college will be the better fit for you. If you’re not rushed to complete classes faster and you’re not trying to fit a busy job into your schedule, then socializing on campus and making new friends is a great experience to have. You can still network online, but it’s much easier to build genuine relationships with professors, advisors, and students in person. In the job world, it still helps to have someone who knows you so they can write a recommendation or refer you. Depending on what field of study you’re going into, on-campus networking may be more beneficial than you realize. Whether you meet your spouse or not, there’s a good chance you will meet some really wonderful people — both students and professors. A great way to meet people on campus is to join a college organization, club, study group, or simply attend a sporting event. 3. You want to be part of an organization, club, or sports team. Many students want to join clubs, sports teams, or religious organizations/ministries. Even if you don’t play on a sports team, many students enjoy attending games and experiencing school spirit with their fellow classmates. Religious organizations like Cru, InterVarsity, and RUF among many others, are extremely helpful for Christian students transitioning into college life and looking to find a community to grow with. At one college, I went to Cru meetings and a Cru women’s Bible study, which really helped me examine my faith as a freshman. At another college, I attended chapel meetings once a week, and at a third college I went to RUF meetings, which was helpful since I was commuting to that school. Being on campus allows you to be in community with like-minded people, but it also exposes you to other people who may not be so like-minded but who you can have great conversations with and build a relationship with to share your faith. “Most universities offer oodles of clubs to join and activities that welcome student participation. Keep in mind that while it’s great to be involved, it’s best to keep it to a number that’s realistic. Trying to do too much can lead to additional stress, and it can really cut into your free time. Finding a healthy balance between academics and extracurricular activities will allow you time for both work and play. 4. You want the traditional college experience you’ve always heard about. There’s no shame in wanting to experience a traditional on-campus college. You want to get out of your house, you want to be on your own, you want to walk around on campus and meet new people. That is completely understandable, for young college freshman. Those who are going back to school later, also want the experience of sitting in a classroom and walking around on a campus — especially if there is a college in their town. The question then becomes what on-campus college is right for you? Here’s what I enjoyed about my on-campus experiences. I got to know people outside of my classes — I had people I could study with and go to the library with, and I enjoyed just walking around the campus. There’s something about a college campus, if you’re there to study, that really helps you focus on your goals and stay in the education mindset. You can still do this from home with distance learning; however, it is a different feeling when you’re doing everything online. For the colleges where I also lived on campus, I was able to to make wonderful friends and gain independence and really think about my life. And for the campus I commuted to, I was able to bond with professors and still take advantage of all the on-campus perks. There is a level of independence and coming into your own identity when you go away to college and stay on campus. This is still possible, of course, for commuter students and online students, but sometimes it requires more effort. Check out our article: 20 Christian Colleges You May Not Know about Yet. 5. You need access to the latest technology and you don’t currently have it. If you don’t have an up-to-date computer and fast internet connection, then an on-campus college is the right way to go. On-campus colleges have computer labs where you can work on the latest equipment with your fellow students, explore the library, and even visit the career center. Some colleges also offer discounts for students to buy laptops. If you’re studying one of the sciences or a field of study that requires lab work and research, an on-campus college is a great choice for all it can offer you. About the only thing you can’t do online is complete science and nursing labs; although I have seen some digital dissection labs online which are interesting. For careers like nursing, scientific research, chemistry, psychology, etc. you need access to a good lab or clinical rotation to perform research. Hands-on fields of study require time on campus, even if it’s just for one week during a semester. In conclusion, there are benefits to both types of schools and there are cons to both. For my college experience, it worked well for me to go to both types of schools. If I were to go back to school now for a graduate degree, I would hands-down choose an online college or university due to the ease and flexibility of fitting it into my schedule. If I were sending my child to college for the first time, I would probably encourage them to choose an on-campus or commuter school to start out. There are always special circumstances if your child is looking to study something like coding etc. that’s mostly online. And if they’re already involved in social groups and don’t necessarily need that interaction on campus, then maybe online would work for them as a freshman. However, most on-campus colleges/universities today offer some online courses, so your student could have the best of both worlds. There are many wonderful schools that fall into the online, on-campus, and hybrid categories. It’s really about your preference, your budget, and your lifestyle. And as parents, it’s all about preparing your child mentally and emotionally for the college transition whether they’re commuting, living on campus, or starting classes online. Related: 3 Bold Prayers to Help Protect Your College Student. This article is part of our Higher Education special coverage channel. Here are other popular articles on the channel.